The curved crucifix that was criticized by Fr. Luigi Villa in 1998 crashed to the ground in 2014. (quoted by Jacques Maritain, Speech to Journées d’Art Religieux, February 23, 1924). First we have a man dies by a cross dedicated to John Paul II falling on him. Then we find out that he lived on a street named after John XXIII. And this all occurred three days before the slated canonizations of both John Paul II and John XXIII. 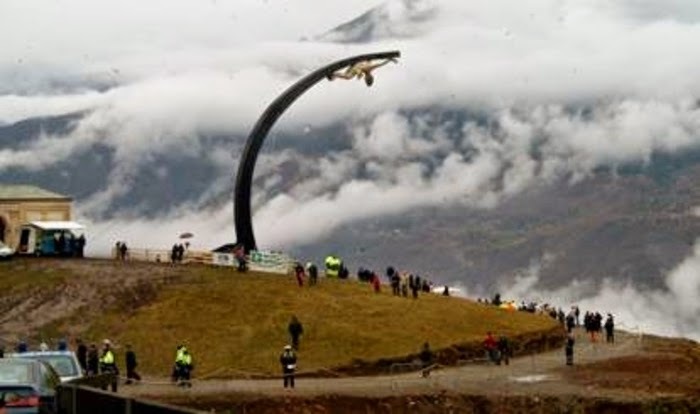 A 21-year old man has died after being crushed by a crucifix erected in honour of Pope John Paul II in northern Italy. Marco Gusmini was killed instantly and one other man taken to hospital, Italian media reported. Part of the 30m-high (100ft) sculpture collapsed at a ceremony ahead of the Pope’s canonisation. John Paul II and his predecessor, Pope John XXIII, are due to be declared saints on Sunday. The crucifix commemorates the Pope’s visit to the area in 1998. The installation, near the town of Cevo, was designed as a large curved cross with a statue of Jesus Christ, weighing 600kg (1,320lb), fixed to the top. A group of children was reported to be in attendance at the time. The cross was designed by sculptor Enrico Job and was created for John Paul II’s visit to nearby Brescia. An Italian man has been crushed to death by a giant crucifix honouring John Paul II that collapsed during a ceremony ahead of the late pope’s canonization. 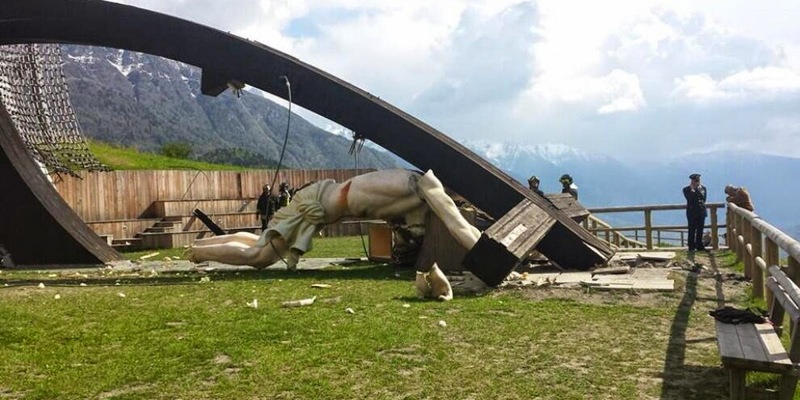 The 30-meter-high wooden cross toppled over during the event near the Alpine village of Cevo in northern Italy, instantly killing Marco Gusmini, 21, on Wednesday. “It is an inexplicable tragedy. A young life, so many hopes, destroyed this way,” Cevo Mayor, Silvio Citroni said. Mr Gusmini had a minor physical disability which may have slowed his reaction to the falling cross, Italian media reports said. The accident happened just three days before John Paul II is declared a saint in the Vatican, along with Italian-born pope John XXIII. According to the Corriere della Sera newspaper, Mr. Gusmini lived with his family on a street named after John XXIII. The Jesus Christ statue on the cross is six meters high and weighs 600 kilograms. The crucifix was curved and fixed to the ground with cables. Its unusual shape was intended to represent the scars of World War II. The cross was designed by sculptor Enrico Job and was created for John Paul II’s visit to Brescia in the Lombardy region in northern Italy in 1998. It was installed in a picturesque spot near the village of Cevo in 2005. “The news has really shaken me. My thoughts go to the poor boy and his family,” Mr Job’s widow, film director Lina Wertmuller, told Ansa news agency. “That cross was a great symbol for Italy, a symbol of protection. But all that seems silly in the face of this terrible tragedy,” she said. After the visit of Pope John Paul II in Brescia, September 20, 1998, for the beatification of Joseph Tovini, Don Luigi Villa wrote an article in “Chiesa viva” n. 301, December, 1998* on the topic of this crucifix of Cevo. On that occasion, Pope John Paul II made ​​a speech in which he took for granted the beatification and canonization of Pope Paul VI. This Crucifix, from that day on, became the symbol of the intention and determination of the high ecclesiastical hierarchy to put Paul VI on the altars. Three days before the canonization of Pope John XXIII and Pope John Paul II, on April 24th, 2014, preceded by the announcement of the date of the beatification of Pope Paul VI, in October, this horrible symbol that offends the Redemption of Christ and the most sacred sign of our Faith is broken and shattered.